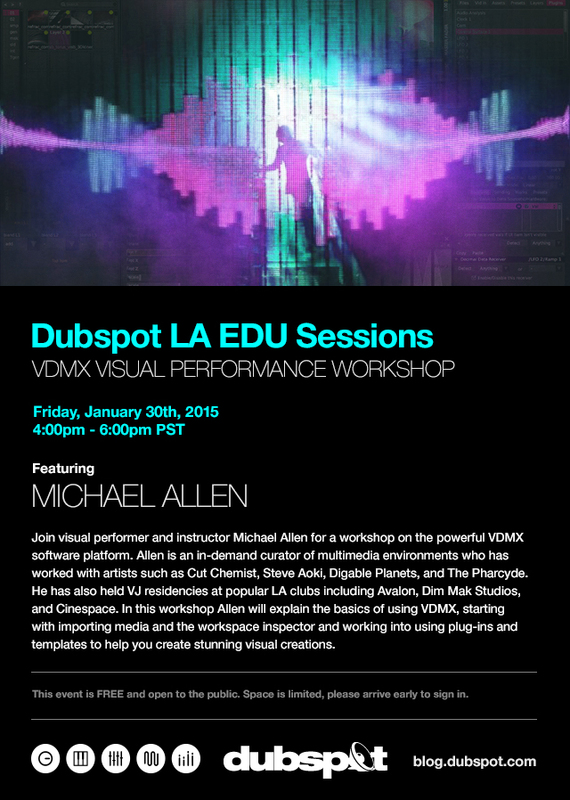 On Friday January 30th, the Dubspot LA EDU Sessions continue with a special VDMX performance workshop with visual performer and instructor Michael Allen. Join visual performer and instructor Michael Allen for a workshop on the powerful VDMX software platform. Allen is an in-demand curator of multimedia environments who has worked with artists such as Cut Chemist, Steve Aoki, Digable Planets, and The Pharcyde. He has also held VJ residencies at popular LA clubs including Avalon, Dim Mak Studios, and Cinespace. In this workshop Allen will explain the basics of using VDMX, starting with importing media and the workspace inspector and working into using plug-ins and templates to help you create stunning visual creations.